Ahorra $25.00 escogiendo la opción ahora. 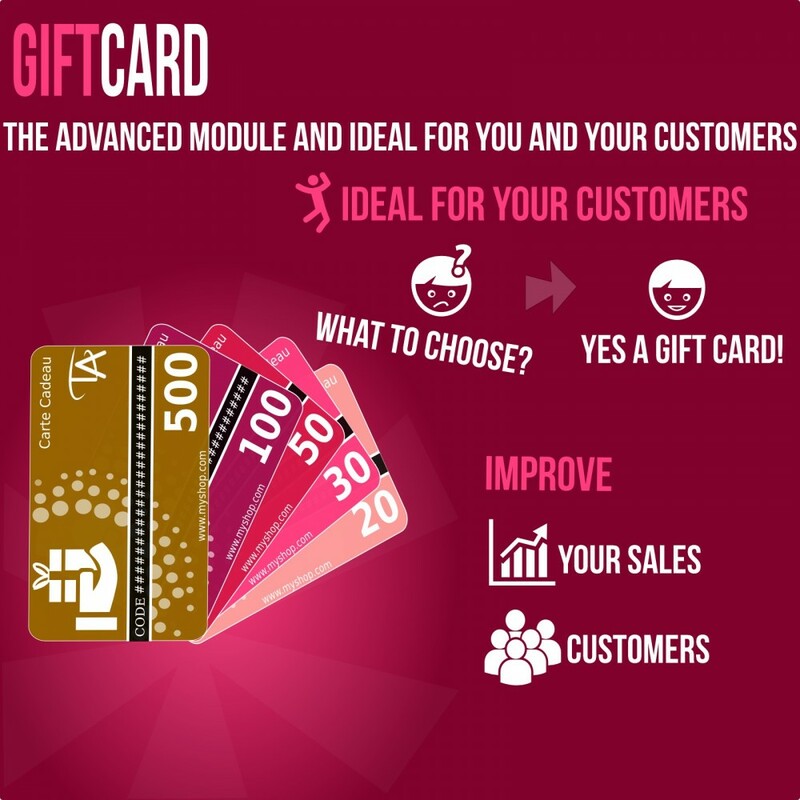 Advanced and complete solution for creating gift cards on your PrestaShop store. Indeed, the perfect solution to please! 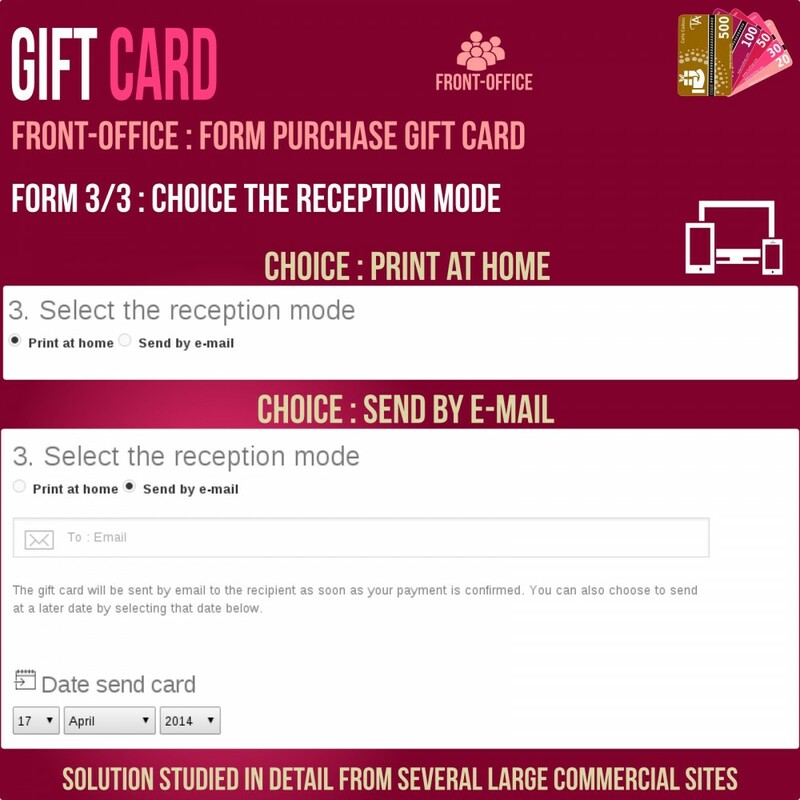 Your customers can buy and offer a giftcard to the person of their choice, once paid an email order is sent to the recipient (the date of send can be provided by the customer). The email will include a voucher, The amount is then available as a voucher on our entire site. After installing the module will present two new pages in the Catalog menu of your back office. managing amounts of your cards. The price of cards will fit currencies..
New information bloc in admin order(backoffice). 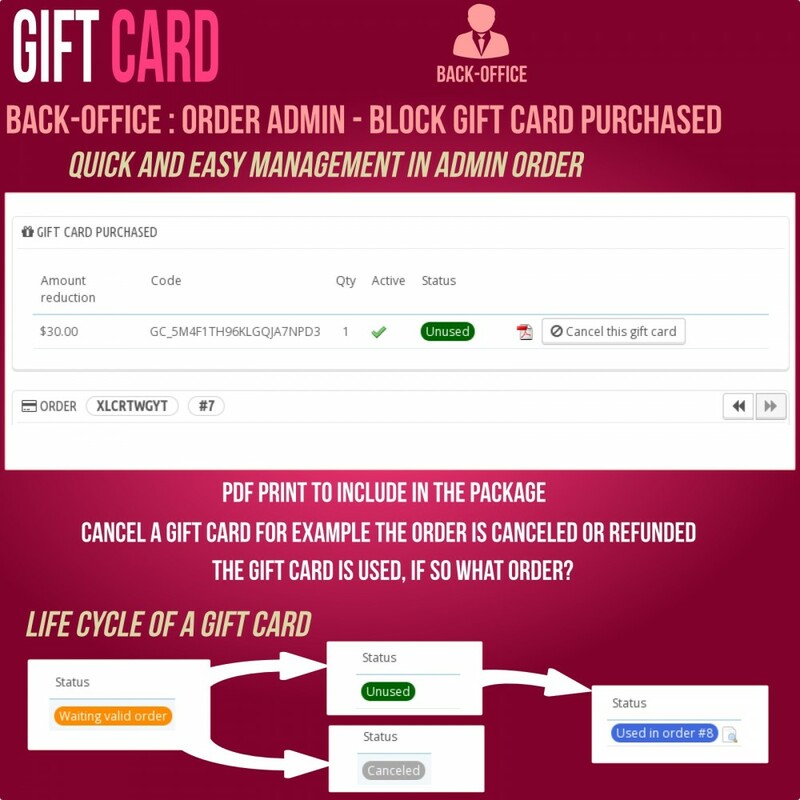 When a order has a gift card, a new information block will be displayed in your admin order page. Check if the status of the gift card is used, if yes you can directly consult the order associated. When a gift card is used in order, you can view the purchase order of the gift card and the status. The solution includes a configuration mode 1 Click this option will automatically create giftcard with different models (which you can customize as you see fit). A new page will be added to your site. Example: http://www.myshop.com/gift-cards. Specific page for the selection of the gift card (simple and efficient). PDF preview of the gift card. 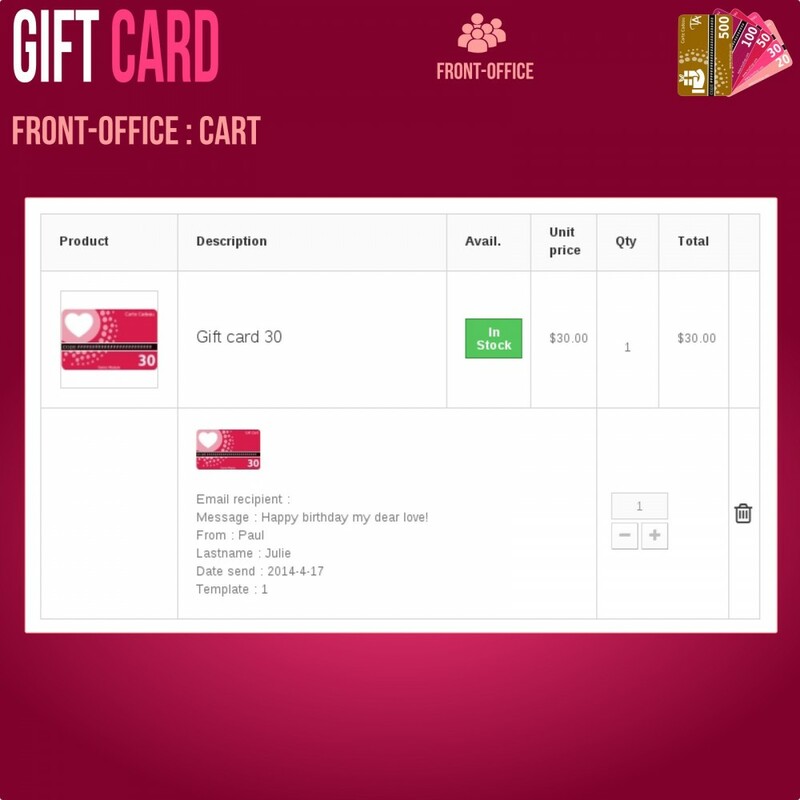 Administration page directly accessible from your back-office : Catalog - > Gift Cards. 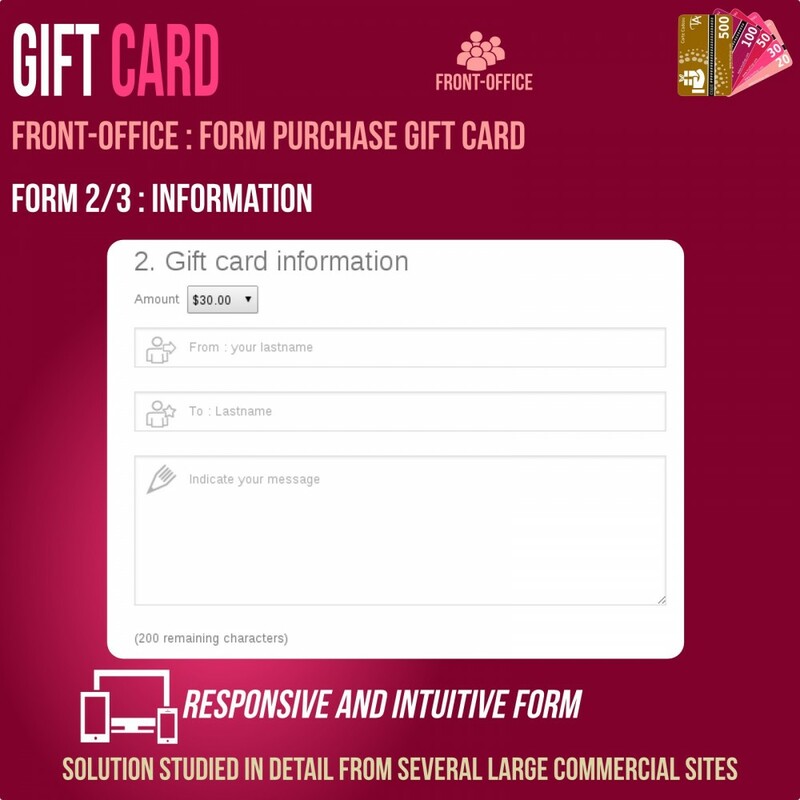 Administration cards , name, period of validity of the gift card amount , amount. Info: The price of cards will fit currencies, so you do not have to set a specific amount for each currency. So your customer can filter models in a particular occasion. The module also includes a customization feature vector image . This feature lets you add variables to your model images. Prerequisites for this feature : Extension Imagick free, The image must be SVG format. 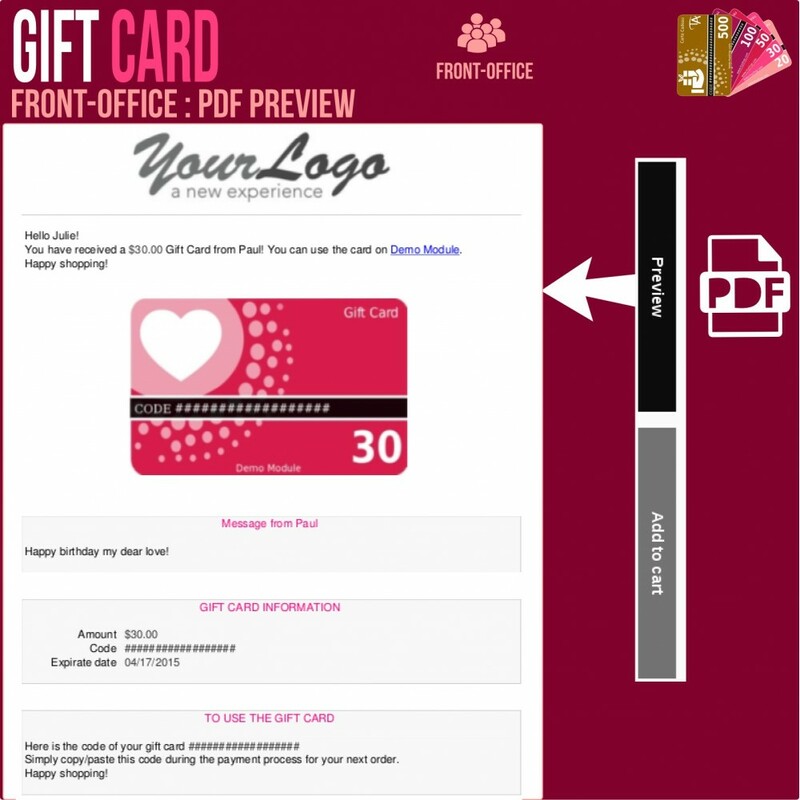 To print a PDF summary of the gift card, the customer can offer in person. View the generated code reduction and a link to the associated rule cart. See if the gift card is used if so, view the link of the order associated. Cancel the gift card, for example following a order cancellation. Permit to view all purchases of gift cards with all associated information (gift card, status information of the recipient, amount, discount code ...). So you can easily know the gift cards in circulation. This is an ideal solution for increasing the amount of the average sales transaction. According to the rules you have chosen, you encourage customers to increase the value of their purchases in order to take advantage of free delivery. More than 18% conversion observed in several e-retailers who have adopted it. The advanced solution for the abandoned cart reminder is what will fit your reminder emails, your promotions to your customers' cart. A pesar de unos pequeños ajustes de programación debido al tema instalado en mi web, todo funciona correctamente. El programador me ayudó con todo de manera rápida y eficaz. Ahora mis clientes pueden comprar las tarjetas con los diseños que yo quiero. Un módulo muy recomendable. Me gusto mucho, muy facíl de instalar, y se acopla muy bien a mi plantilla, El servicio fue más halla, se elevo, no solo repero mi problema sino que reparo otros, los felicito!! Module ready for use, with over 20 model. TimActive is specialized in the development of PrestaShop modules. Our modules are simple and intuitive, and participate in the growth of e-commerce. Do not hesitate to contact us for tailor-made developments.